It is clarified that such mandatory quoting of Aadhaar or Enrolment ID shall apply only to a person who is eligible to obtain Aadhaar number. As per the Aadhaar (Targeted Delivery of Financial and Other Subsidies, Benefits and Services) Act, 2016, only a resident individual is entitled to obtain Aadhaar. Resident as per the said Act means an individual who has resided in India for a period or periods amounting in all to one hundred and eighty-two days or more in the twelve months immediately preceding the date of application for enrolment. 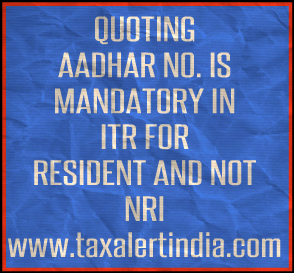 Accordingly, the requirement to quote Aadhaar as per section 139AA of the Income-tax Act shall not apply to an individual who is not a resident as per the Aadhaar Act, 2016.